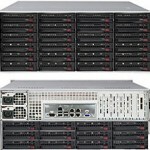 eRacks Open Source Systems announces the immediate availability of the eRacks/NAS36 rackmount storage server, with 36 removable 3.5″ hard drives, which yields a maximum of 144TB (Terabytes*) of raw storage with current widely-available technology. The eRacks/NAS36 rackmount server is shipped pre-configured to the user’s custom specs, with any available open-source software, and more flavors of Linux or BSD available than any other vendor. 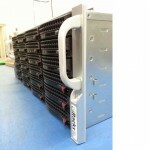 eRacks Open Source Systems is pleased to announce theeRacks/NAS36 rackmount storage server. Available immediately, it combines a rack usage of only 4U with a density of 36 drives (24 front and 12 rear), which, when combined with the current technology of widely available 4TB drives, yields a total storage of 144TB. With the forthcoming 6TB drives from WD HGST, this will increase to 216 Terabytes*, giving a truly petascale solution in only 4U of rackspace. 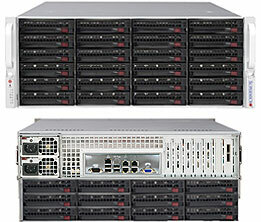 This rounds out eRacks’ line of rackmount multi-drive storage servers and NAS solutions, nicely filling the gap between the 24-drive eRacks/NAS24 and the all-front-loading 50-drive eRacks/NAS50, eRacks’ flagship storage server. When populated with 36 removable drives in only 4U, this represent a density / price breakthrough – using the best value (lowest price/TB) 3TB drives, this enables 108TB of raw storage in only 4U, and for less than $20,000, as configured on the eRacks website. The unit is also available partially populated, at a reduced price, to make it accessible at a lower initial price, and the storage can be increased later by filling the empty drive trays. It’s signature service, eRacks will be happy to install any of the popular Linux distributions on request – Ubuntu, Debian, RedHat, Centos, Fedora, even the Arch Linux distro, which is growing fast in popularity, as well as FreeBSD, OpenBSD, or other Open Source OSes. eRacks will also pre-install any open source NAS software, such as FreeNAS, OpenFiler, NAS4Free and OpenMediaVault, among others – and administrative dashboards and web GUIs are offered on most of these software choices. Also available is best-of-breed Open Source software for BigData / Cloud storage, NAS, and networking – including Hadoop, MooseFS, CIFS, GlusterFS, etc – and eRacks is a partner with MooseFS.org. In addition, the eRacks policy is to install any Linux/BSD distro or Open Source software on request – Contact eRacks today at info(at)eracks(dot)com to see how they can meet your needs. *For the purposes of this press release, the term “Terabyte” is used to mean one trillion bytes – eRacks understands the issues about this, we are using the term as the disk drive and other industry manufacturers use it. Ubuntu 18.04 LTS (Bionic Beaver) is out! Docker says: “Available for both Windows and Mac” – WTF? admin on Ubuntu 15.04 Vivid Vervet!